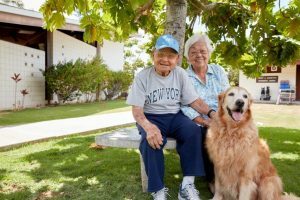 In 2004, the Kilohana Senior Enrichment Center received a grant from the Harry & Jeanette Weinberg Foundation allowing the Center to construct a multi-purpose building. One of the purposes of this building is to house the Kilohana Adult Day Care Program and Day Health Program operated by Arcadia. outreach, we nuture the spiritual, cognitive, socio-emotional and phyiscal well being of those adult individuals whom we are able to accommodate. 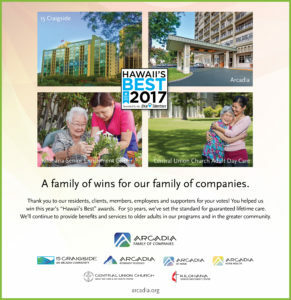 We are proud to partner with Arcadia Family of Companies to provide excellent services and care for our seniors. We provide family caregiver(s) with time and opportunity to care for one’s own needs or pursue one’s own interests by providing care and supervision outside of the caregiver’s own home. We enable a participant to develop relationships in a group setting outside the family in a socially stimulating environment. Our hours of operation are M-F, 7:30 a.m. to 5:30 p.m.
Click here for the Senior Enrichment Center Website.